Invasive Amur honeysuckle (Lonicera maackii) creates a dense shrub layer in deciduous forests in eastern North America that negatively impacts native herbs and tree seedlings. We predicted that higher vegetative cover caused by this shrub would increase abundance and diversity of insects and alter composition of insect assemblages. We used paired plots, one with and one without honeysuckle, in ten forest locations in southwestern Ohio, USA, to sample insects and measure diversity and vertical cover of vegetation in the shrub layer. Vertical cover of this vegetation was higher on honeysuckle-present plots, but diversity of shrub-layer vegetation did not differ between honeysuckle-present and honeysuckle-absent plots. Species diversity of Hexapoda, Coleoptera, and Psocoptera, richness of Hexapoda, Coleoptera, Diptera, Hymenoptera, and Psocoptera, and abundance of Hexapoda, Diptera, Hymenoptera, and Psocoptera were higher on honeysuckle-present than on honeysuckle-absent plots. Evenness did not differ between honeysuckle treatments. Nonmetric multidimensional scaling distinguished taxonomic composition in honeysuckle-present plots from that in honeysuckle-absent plots. Presence of vertical cover explained higher richness of Hexapoda and Coleoptera, and higher abundance of Hexapoda, Diptera, Hymenoptera, and Psocoptera. Attributes of honeysuckle, independent of its contribution to vertical cover, explained increases in richness of Hexapoda, Coleoptera, and Hymenoptera and abundance of Hexapoda, Hymenopera, and Psocoptera. These attributes of honeysuckle could include a more complex vegetative structure, a greater availability of resources such as food, detritus, or shelter, and/or a more favorable cooler and moister microenvironment. 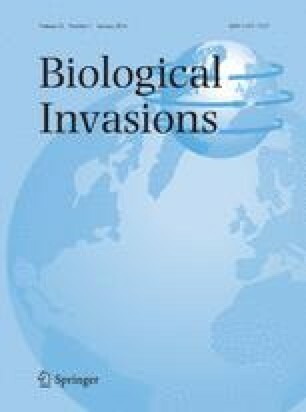 To more fully understand the mechanisms causing increased richness and abundance of insects in honeysuckle-present areas, detailed studies on these attributes of honeysuckle would be necessary. The online version of this article (doi: 10.1007/s10530-013-0505-0) contains supplementary material, which is available to authorized users. We thank T. Culley, S. Matter, and G. Uetz for suggestions and direction during this project, C. Christopher for initiation into the field, advice, and support, S. Hyams, S. Jacob, and G. Klein for helpful advice, K. Kruse for lab assistance, B. Loomis for assistance with field work and moral support, the Cincinnati Nature Center, Cincinnati Park Board, Hamilton County Parks, and Ohio Division of Natural Resources Parks Department for permission to conduct research on their property, the Department of Biological Sciences, University of Cincinnati, for financial support through the Wieman-Wendell-Benedict Fund, and family and friends for their support. We also thank reviewers for insightful comments that improved our manuscript.